The one bedroomed Dionysos Cottage a is part of Dionysos village with a private pool, modern interiors and shrubbery-studded grounds. Built on top of a jaw-dropping canyon and overlooking the Bay of Kumlubuk on the Bozburun Peninsula in Turkey, the villa boasts panoramic sea views. Well worth the extra price tag, it's part of a luxurious complex, so you have access to quality facilities including two restaurants, a serene spa and weekly events like wine tasting, yoga and moonlight cruises. Designed with your utmost privacy in mind, this peaceful villa stands on a great mass of rock that juts into the sea, and the rustic stone architecture elegantly blends into the natural surroundings. Enjoy the warm sun on your cushioned sun lounger and terrace, before taking a cooling dip in the turquoise waters of your private outdoor pool. Inside, the design is minimalist with contemporary-cool and natural-coloured furnishings, and beautiful Turkish art like painted ceramic wall plates. The bedroom is equally seductive and stylish (made up as twin or double), with plenty of holiday wardrobe space, and there's a fully-equipped kitchen with an oven and a microwave should you wish to dine in. You can also relax in the lounge on the comfortable sofa, and there are doors leading straight out onto your pool terrace, flooding the villa with natural light. Extra thoughtful features include Wi-Fi, complimentary water every day and a safety deposit box. In the resort, the two restaurants only use home-grown organic produce, and the chefs have been trained by Didem Senol (Time Out Award for Top Istanbul Chef 2010) for a magical journey of taste. You can also book in for a massage other treatment to feel balanced, revitalised and grounded. Located on the craggy mountainous Bozburun Peninsula, Dionysos Cottage is the perfect starting off point to explore this beautiful stretch of Aegean coastline. The moon shaped bay is just a one-hour sail from lively Marmaris town with waterfront restaurants, a traditional shopping bazaar and a castle. In the surrounds, you can traverse the wooded mountains, coastal villages and beaches, and get a feel of real rural Turkey. Dionysos is an adult only hotel with the following exception: Children of all ages will be accepted between 1 July – 31 August 2019. 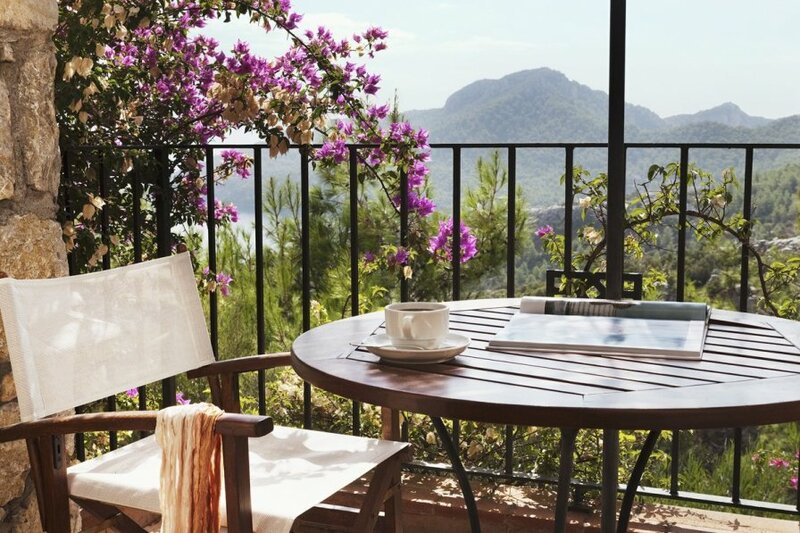 Dionysos Cottage is set in a peaceful spot, nestled into the hillside at the fabulous Dionysos Village which overlooks majestic Kumlubuk Bay on Turkey's mountainous Bozburun Peninsula. The villa is a short drive from the beach – perfect for swimming and snorkelling – and is in sight of the harbour of Marmaris. There is a complementary shuttle service to the beach. The village also has a spa, honesty market for supplies, 3 hole putting green, boutique, gym, laundry service, tennis court and wine cellar. For outdoor adventuring, you can hire mountain bikes and head to the local villages (Bayir, Sogut and Selimiye) to catch a glimpse of Turkish life as it's been for generations. You can also walk along a 3km forest road to the summit of the Palamut Mountain with incredible views of the beautiful Greek islands of Rhodes and Symi. A hidden forest trail will take you down the western side of the mountain where you will observe the rich flora of the maquis. Other ways to spend your time if you can drag yourself away from the villa include a visit to ancient sites such as Stratonikeia, a luxury day at sea on one of the restored lifeboats, Olive oil or wine tasting, yoga or dinner at the exclusive Nar restaurant. These are arranged by the Dionysos for an additional charge. You can travel to vibrant Marmaris, where you can stroll the cobbled streets of the old town and visit the castle and museum. Haggle for local honey and traditional rugs in the covered bazaar and discover locally produced organic delights such as cheese and spices. Finish off the day with a massage in a traditional Turkish Haman (baths).